7:10 AM – While we were waiting for our local flight from Fiji’s Viti Levu Island to the more remote Vanua Levu Island, Cagey noticed that we were missing a baggage claim check for one of our bags. We were lucky she did, since it was not going to get on the plane. 7:30 AM – We changed more money to the local Fiji dollar. At the time, the exchange rate was approximately at one Fiji dollar equaled 45 cents U.S., which meant our dollar went a long way down there. On a last minute whim, we raced over to Air Pacific and extended our return two extra days, to make up for the time we had lost at LAX. 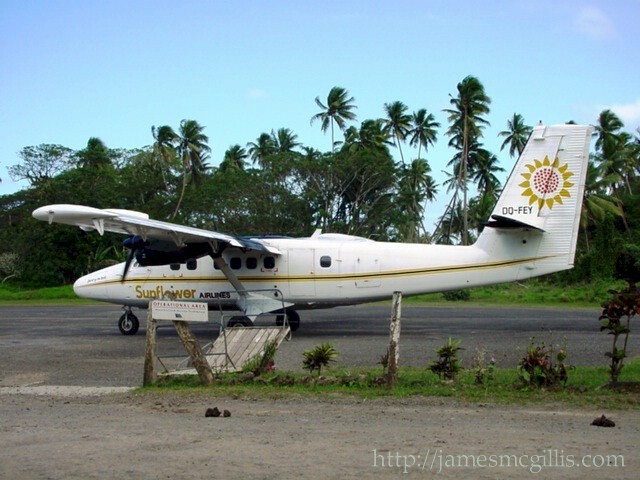 8:30 AM – We boarded our Sunair, local flight to Savusavu, a town on Vanua Levu. While we were waiting, we had spoken to an Air Pacific employee from New Zealand. He indicated that as each Sunair plane came up for major overhaul, if the repair price was too high, the company simply mothballed it. As we set out across the “Bligh Water” to the other island, that knowledge gave us a tremendous feeling of confidence. 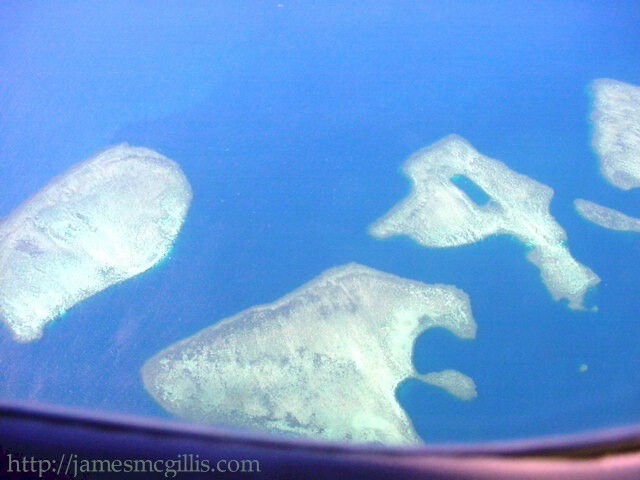 8:45 AM – We took to the air and got a great view of the coast and the various small islands, each with its own resort. In fact, one or two of them were nothing but a resort and a beach. Looking down, the extent of the deforestation through burning of grasslands and logging of hardwoods on a commercial scale was disappointing to see. Agriculture, mostly sugar cane, covered almost all practicable areas and the burning of the bush is deeply rooted in the Fijian tradition, practiced throughout the islands in seemingly random ways. 9:15 AM – As we climbed, both of our Indian pilots held the overhead throttles full open in what looked like some kind of Los Angeles Gang handshake. It made me wonder if it was some form of bonding or if they had experienced the throttles snapping back to their “idle” position at some time in their careers. After that, the pilot in the left seat never seemed to do anything more than to chat with his right-side compatriot. I always thought the guy on the left side was supposed to do the flying. I guess if they can drive on the “wrong” side of the roads (in the British tradition), they can fly from the “wrong” side of the plane. 9:20 AM - As we skirted the coast of the main island, we climbed steadily and soon were at 4000 – 6000 feet. From there, we headed offshore towards the unseen Vanua Levu, up ahead. We crossed the Bligh Water, where in 1789 cannibals chased Captain William Bligh, of Mutiny on the Bounty fame. He and the remnants of his loyal crew and almost lost their lives in that chase. The Fijians were the original human settlers of these Pacific Islands. At their peak, prior to the European conquest of the islands, the Fijians had developed incredible seventy-foot long "warships”, with up to 250 warriors aboard a craft that could travel at speeds up to twelve knots. 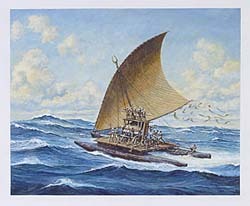 Perhaps this that type of craft chased and almost caught the Englishmen during the first European encounter with the “friendly” natives of Fiji. The legend of Fiji as the “Cannibal Islands” persisted for centuries and somehow got mixed up in our American culture with natives boiling Europeans in big pots (probably thanks to a recurrent theme in New Yorker Magazine cartoons). The reality is that cannibalism was practiced as part of their warfare, politics and as a crude form of humor. It was relatively common for the victor to lop off some fingers or a hand of a vanquished enemy. The appendages would be cooked and then eaten in front of their former owner. The epicurean would comment on the tenderness and flavor of the flesh and might even ask if the former owner might enjoy having some himself. Fiji has more Christian missionaries per square kilometer than any other place I have ever seen. Although they claim to have put an end to cannibalism during the 1800’s, we have it on good authority that ritual killing and possible cannibalism was still practiced as late as sixty years ago in some of the more remote parts of the islands. 9:30 AM – Well out over the Bligh Water we began to see a profusion of reef structures seeming to block any logical navigation of the shallow sea below us. Waves crashed over the reefs, and narrow bights were the only passages we could see between them. One of our pictures, taken through the Plexiglas of the airplane window gives you an idea of their scope and beauty. Only the live-aboard scuba dive-boats spend any time out here in a wilderness of reefs and fishes. 9:45 AM – As Arlo Guthrie said in verbal introduction to the song “Coming into Los Angeles”, “We were coming down mighty fast”. I think that the idea was to get our airplane as high as we could in case we had to try to glide in “engineless”. If the engines had failed over mid channel, we would not have had a chance to get to dry land in either direction. Still, it is the thought that counts. 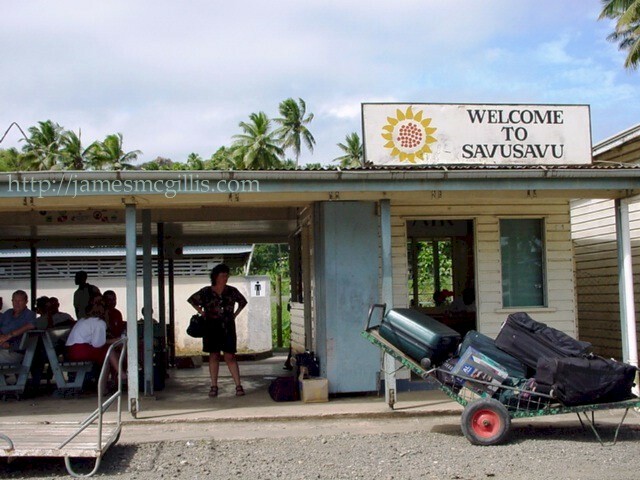 As we approached Savusavu Airport, there was no sign of civilization, then suddenly we could see a narrow strip of tarmac that extended from the beach directly inland for about a half mile. The pavement appeared to be a few feet wider than the width of the landing gear, as we roared in at what seemed to be very close to our cruising speed. Somehow touched down and braked to a stop in front of the terminal, which is typical in its tropical-minimalist approach to facilities. It had an office, open air bench seating and restrooms out back. That was all. 9:50 AM – Since the aborted Fijian coup of 2000, times have been tough for business in Fiji and all the rental car companies have pulled back their operations. Through a series of telephone conversations with our resort owner and her ability to help reschedule our rental car rendezvous, our vehicle was waiting there, as we had hoped. 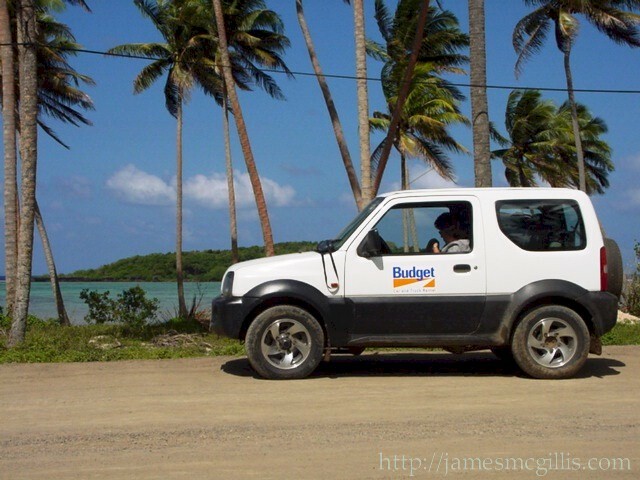 To us it seemed like a miracle, since the Budget Car Rental agent had to drive it over to us from Labasa, on the far side of the island. That required a 90-minute trip by car, over a mountain pass. Cagey had booked the car on the Internet. They had given us a rate that would have been good in the U.S. let alone out in the middle of nowhere (which is where I was sure we were). 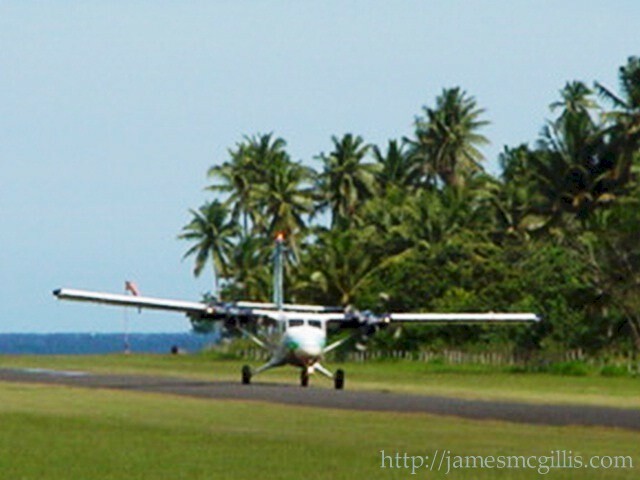 I asked the agent how he would get back to his office, thinking at that time that it was just over the hill in Savusavu. He indicated that he would take a taxi back to the office. It was only when we drove half way to Labasa, several days later, that I realized where he had gone in the cab. So there we were in our little Suzuki Jimny (yes, it is spelled correctly) four-wheel drive, ready to hit the trail to Lomalagi Resort (which, by now you have figured out is pronounced “Lomalonghi”). This is Chapter Two of ten chapters. To view the previous article in this series, click HERE. To view the following article in this series, click HERE.